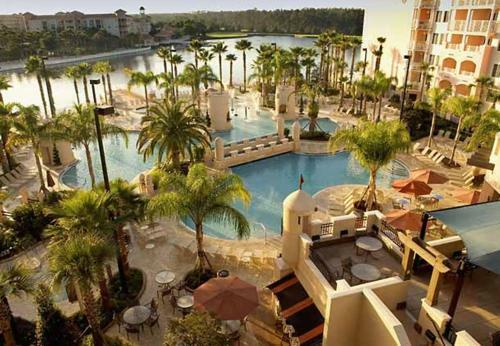 For guests that have come to Orlando to see the Mouse, they will find that the hotel offers an oasis of relaxtion away from Mickey and his friends. This hotel is a timeshare vacation villa. The hotel has spacious luxurious, one two and three bedroom non-smoking villas that can accomodate up to 10 people. Families may enjoy a bar-b-que in the picnic area. The hotel has a few restaurant options for guests. An on-site convenience store is open for last minute sundries. Golf fanatics will find themselves in golf paradise. The resort course was designed to be a place to help golfers improve their skills, while offering a unique and outstanding golf learning experience. 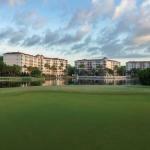 The nine-hole golf course is perfectly suited for golfers of all ages and abilities. The par 32 course is 2,300 yards long and is designed to challenge each golfer to hit a variety of shots. Other fitness activities are available. The hotel is conveniently located to all the theme parks. Visitors to this resort have access to many vacation activies including golf, tennis, basketball and swimming in one of the hotel pools. Poolside food and drink service is available. Kids of all ages will enjoy Eddy's Ice Cream Stand. For those looking for a quick snack, Pizza Hut is sure to fit the bill. This non-smoking resorts offers guests the choice between one two and three bedroom villas. Guests can enjoy all the amenities of home, while relaxing in a luxurious upscale resort. All rooms have kitchen facilities including a microwave, refrigerator, coffee maker, plates and utensils and pots and pans. Guests also have access to a washer and dryer in the unit. After a day in the sun guests can enjoy a relaxing bath in the jet spray tub. Sit back in your room and relax with the morning paper which is delivered daily to the room. Should you need help with reservations the concierge is there. For those who cannot go away without logging on, internet service is available in the rooms.